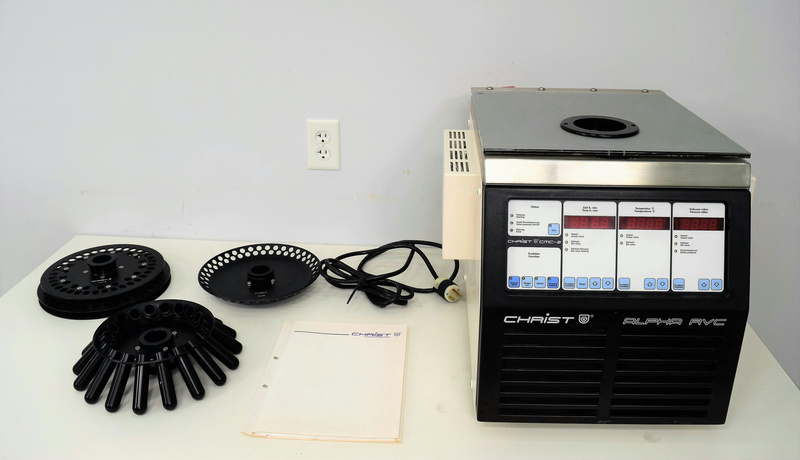 Martin Christ Alpha RVC Rotational Vacuum Centrifuge Concentrator w/ Rotors . New Life Scientific, Inc.
New Life Scientific technicians tested the RVC for functionality and concluded that it is functional. The vacuum pump activates as required and offers the temperature and time control. The maximum speed is 2250 rpm and this is not adjustable, but operates quietly and holds the vacuum seal. This centrifuge comes with four rotors: two are #124205, one is #110546, and the last one is #124200. This RVC is in good cosmetic condition and fully-functional. The included rotors appear to be in good cosmetic condition. The Christ Alpha RVC vacuum centrifuge can be combined with oil-free or high vacuum pumps and a choice of cold traps. This method is suitable for drying a wide variety of aqueous samples, and solvent-based samples in particular. This RVC was tested and is in great operating condition. Included are four extra rotors.